Located in the heart of the Central Pacific coast region of Costa Rica, Jaco (pronounced: ha-ko) has long been a favorite of vacationers and expats. This lively beach town features several large resorts, as well as many options for longer-term residents, like condos, gated communities, and lots for building. The wide range of housing options in all price ranges, from budget to luxury, as well as many amenities and comforts of home, make living in Jaco, Costa Rica a great choice for lifestyle and retirement overseas. Beachfront condos in the heart of town start at $160,000. If you’re willing to be a few minutes outside of town, you can find condos for under $60,000. Homes start at $150,000, although there are plenty of deals to be found. Jaco is a tourist-oriented town. That means a “main drag” filled with bars, restaurants, and nightclubs, as well as plenty of unique shops and art galleries. Thanks to the tourist trade, many locals speak English. Just outside of town is a grocery store with many imported items, called Automercado. If you’re missing that Ben and Jerry’s ice cream or Parmesan cheese, you’ll find it here. For golfers, there is a world-class course at the Los Suenos luxury residential resort. And, of course, Jaco is well-known for its 2.5 mile-long beach. You can relax on the sand or surf some of the best waves in the country. Competitions are held here regularly. But there are also beginner-friendly waves – check in at one of the local surf schools for details. 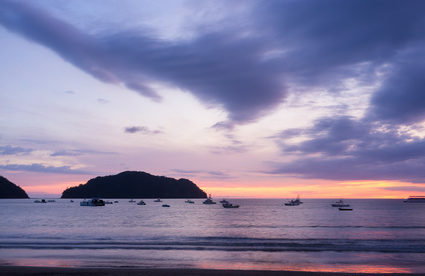 Living in Jaco, Costa Rica is also convenient. San Jose, the country’s capital, is about an hour away on a new modern highway. That makes it easy to visit the large private hospitals and medical and dental clinics there, as well as the best public facilities. Costa Rica’s main international airport, Juan Santamaria, is even closer, which makes picking up visiting friends and relatives or flying back home yourself – easy.